Often, the term “insider threat” invokes images of malicious employees lurking in the shadows of an office attempting to steal company secrets or bring down the system. The reality is that this type of evil insider behavior happens infrequently at most companies, with instances of these threats occurring once in a blue moon. The real threat and biggest risk to confidential data is the negligent employee, who’s actions are more commonly categorized as the unintentional insider threat. ObserveIT recently held a webinar with Dr. Eric Cole, former CTO of McAfee and founder of Secure Anchor, entitled Unintentional Insider Threat: Employee Security Mistakes that Put Your Data at Risk. 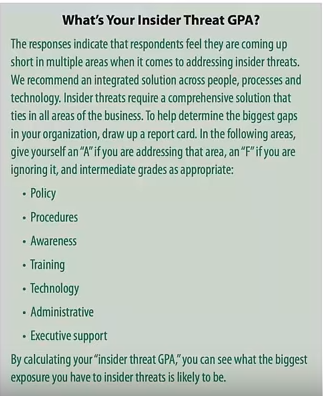 He implores cyber security professionals to implement an insider threat program, using the foundations of Educate, Deter, Detect and Investigate to protect companies from the unintentional insider threat. When a cyber security professional attempts to speak with C-Level management about mitigating and even preventing insider threats, the feedback may be along the lines of, “Everyone here is happy. We don’t have disgruntled employees, so we don’t have to worry about insider threats!” In many case, perhaps that’s true. But, if the conversation is turned around to review unintentional threats – employees who make mistakes and inadvertently cause harm – that’s often when executives will begin to listen. A review of the 2015 Verizon Data Breach Investigation Report would reveal that insiders are responsible for 90% of security incidents, C-Suite managers will take notice. · 29% of insider threats are from the deliberate and malicious insider. · 71% of insider threats are unintentional, with misuse of systems, log-in/log-out failures and cloud storage leading the way. How Well is Are Companies Handling the Insider Threat Assessment? Seize the moment! If companies are not currently dealing with the insider threats, they need to! Make no mistake, companies still need to watch out for external threats. But, they need to augment those security protocols for insider threats and unintentional insider threats. When considering threat modeling externally, organizations think about Firewalls and other deterrents to keep an outside threat from accessing systems. With an insider, most of those vulnerabilities that exist can’t be removed. That is, if employees are to remain productive. All users need access and special permissions to perform his or her job. What happens when an employee wants to download software or click on an attachment that will not run unless it runs with an administrative login? An insider has to assess the threat on his own, even though he’s likely not qualified to do so. The user believes the threat to be low, the cyber security team knows that this particular risk is high. This is where user activity monitoring comes in. ObserveIT offers an Insider Threat Management Solution that protects companies and employees from unintentional threats. E.g. The employee performs a risk assessment on-the-fly and chooses to download an attachment they’re not supposed to. He/she will be shown a pop-up window. The window will indicate they’re working outside of the established cyber security policies. This simple pop-up can stop employees from being tricked or manipulated. Users won’t undertake spontaneous risk assessments to determine what are acceptable risks. Instead, they’ll receive policy notifications that keep them and the company safe. And, employees will learn as they go.